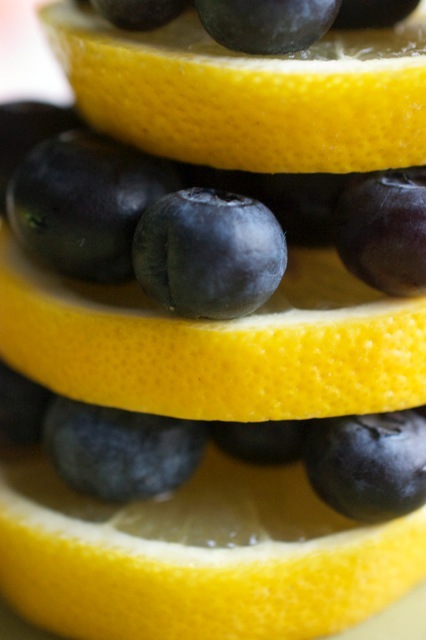 We believe that there are some combinations that were just made in heaven, and one of those is the pairing of blueberry and lemon. The idea for these cookies came courtesy of a head-strong toddler, who insisted that the chocolate chips in her mini-kitchen’s fake plastic chocolate chip cookies were, in fact, “Booberries.” We immediately thought, “That’s a great idea!” and off to the kitchen we went. . . . and a blueberry lemon twist on the traditional oatmeal raisin cookie was born. We used dried wild blueberries that we purchased from our local market. They are sometimes hard to find, but when you do… oh, the possibilities are endless. Think of them as a raisin, but even better! 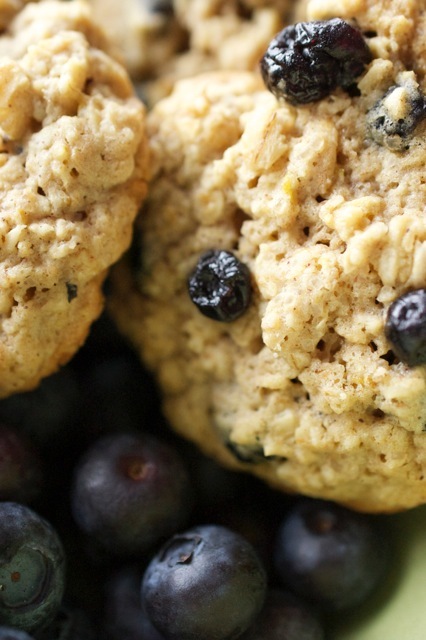 We do not suggest using fresh blueberries in this recipe because they add water, which will result in soggy, flat, and somewhat tasteless cookies. If you have a dehydrator, you can always make your own dried blueberries. Also, having had Gluten Free Oat Flour on hand from a previous baking experiment, we decided to make these gluten free. If you are preparing these for someone with a gluten sensitivity or celiac disease, keep the following in mind. Oats are naturally gluten free; however, due to common cross-contamination from the field, in transit, and in the milling process, oats are only truly gluten free if they are certified gluten free. 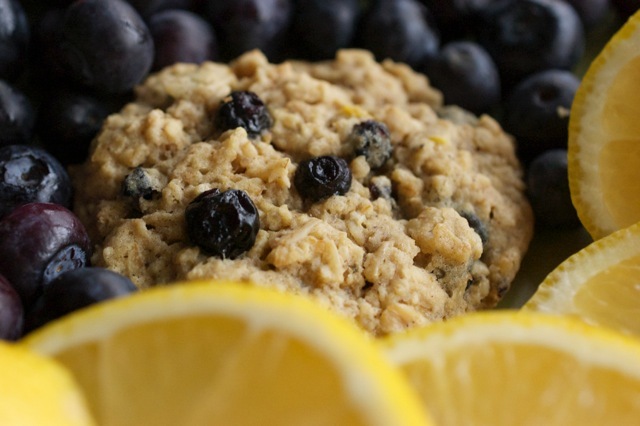 Make sure you buy certified gluten free oat flour and certified gluten free old fashioned quick cooking oats for this recipe to avoid having inadvertently gluten-laced cookies. On the other hand, if you are just happy making a cookie sans all-purpose flour, you can be less stressed about it and use ordinary old-fashioned quick cooking oats, etc… Or if you think these cookies sound fabulous, but don’t care whether they have gluten or not, you can substitute 1 ½ cups all-purpose flour for the oat flour and corn starch! 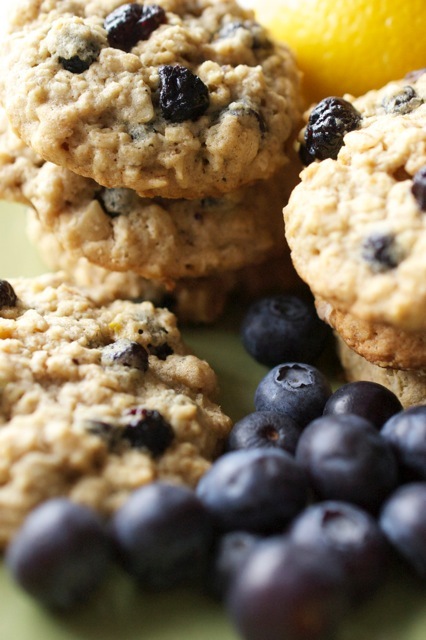 Overall, these cookies are lighter on the palate with a bit more of a crumbly texture than your traditional oatmeal raisin cookie. Plus, they bring a delightful lemon zing. Try them out and let us know how you like them! 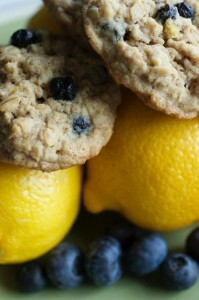 These gluten free cookies have a delightful lemon zing! 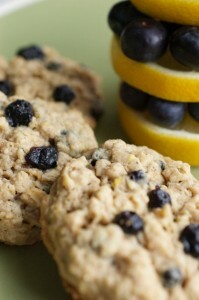 Make sure to use certified gluten free oats and oat flour. Cream together softened butter, raw sugar, and granulated sugar until light and fluffy. Keep in mind the raw sugar will keep this a little gritty. Add vanilla and lemon extracts, followed by lemon zest and lemon juice. Beat until combined. In a separate bowl whisk together oat flour, corn starch, baking soda, cinnamon, and salt. Add dry to wet ingredients, mixing until combined. Stir in oats until combined. Fold in the blueberries. Cover and place dough in refrigerator for 1 hour or overnight. Preheat oven to 350°F and line cookie sheets with parchment paper. Roll about a tablespoon of dough and place them on the lined cookie sheet leaving three inches of space between each, flattening each one slightly with your fingers. 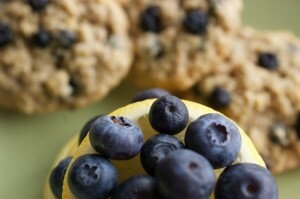 Press a few extra dried blueberries into the tops of the cookies, for looks. Bake at 350°F for 10-14 minutes, or until edges are slightly golden. Remove from oven and cool on baking sheet for at least 2 minutes before gently moving them to a cooling rack using a spatula. The dough must remain cold. If it gets to warm, from the scooping and rolling, place the cookie dough on the baking sheet and stick them in the freezer or refrigerator for about 10 min. Remove from the freezer/refrigerator and straight into your oven. This will help the cookies hold their shape during the cooking process.